An oscillator is a repeating waveform with a fundamental frequency and peak amplitude and it forms the basis of most popular synthesis techniques today. Aside from the frequency or pitch of the oscillator and its amplitude, one of the most important features is the shape of its waveform. The time-domain waveforms in Fig. 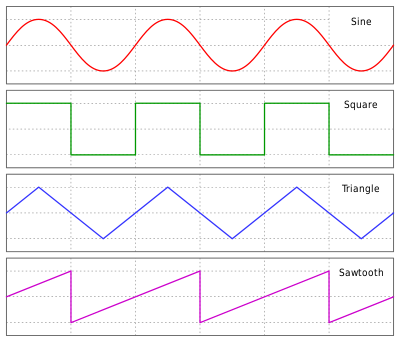 5.1 show the four most commonly used oscillator waveforms. Although it is possible to use all kinds of unique shapes, these four each serve a range of functions that are suited to a range of different synthesis techniques; ranging from the smooth, plain sound of a sine wave, to the harmonically rich buzz of a sawtooth wave. Oscillators are generally controlled by a keyboard synthesiser or MIDI protocol device. A key press will result in a MIDI note value which will be converted to a frequency value (Hz) that the oscillator will accept as its input, and the waveform period will repeat accordingly to the specified frequency. From here, the sound can be processed or manipulated in a variety of ways in the synthesizer or program to enrich or modify the sound further. , as shown in Fig. 5.2. In a digital system, the generated waves will be a series of equally-spaced values at the sample rate. Figure 5.2 One cycle of a sine wave with phase 2π (radians). length cycles a second, at the sample rate. This value can be passed to a sine function to create the output value, between the user specified peak amplitude. and resets to 0, undesirable discontinuities would occur, causing harmonic distortion in the oscillatory sound. The square wave cannot be generated from a mathematical function library so easily but once again the algorithm is particularly straightforward since it is constructed from straight line segments. Unlike the sine wave, square waves have many harmonics above their fundamental frequency, and have a much brighter, sharper timbre. After examining a number of different waveforms it will start to become apparent that waveforms with steep edges and/or abrupt changes and discontinuities are usually harmonically rich. Figure 5.3 One cycle of a square wave with phase 2π (radians). As is evident there is no reliance on an external function, the square wave can be defined by simple arithmetic, since it essentially switches between two values per cycle. One can expand on this by introducing a new variable which controls the point in the cycle the initial value switches to its signed value; this waveform is known as a pulse wave. Pulse waves are similar in character to square waves but the ability to modulate the switching point offers greater sonic potential. Figure 5.4 One cycle of a sawtooth wave with phase 2π (radians). Figure 5.5 One cycle of a triangle wave with phase 2π (radians). The algorithm then, is similar to the previous examples but with the gradient equations incorporated into it. In the example algorithms presented here it is evident that a range of different waveshapes can be designed, but there is the realisation that the shapes can only be described as mathematical functions. Complex shapes may become very demanding due to the increased processing power for more complicated mathematical statements. There may be a situation or a desire to escape the limitations or complexity of defining an oscillatory waveform using mathematical formulae or line segments. As mentioned before, this could be a concern for processing power, or simply the fact that it would be easier to specify the shape through an intuitive graphical interface. In cases like these, musicians and engineers may use wavetables to be their source oscillator. Wavetables are popular in digital synthesis applications because accessing a block of memory is computationally faster than calculating values using mathematical operations. Figure 5.6 The basic structure of a wavetable oscillator. The wavetable is in essence an array of N values, with values 1 through to N representing one whole cycle of the oscillator. Each value represents an amplitude at a certain point in the cycle. Wavetables are often displayed graphically with the option for the user to draw in the waveshape they require, and as such it represents a very powerful tool. There is also the possibility of loading a pre-recorded waveshape as well; but note that a wavetable oscillator is only a reference table for one cycle of a waveform; it is not the same as a sampler. The wavetable has associated with it a read pointer which cycles through the table at the required speed and outputs each amplitude value in sequence so as to recreate the waveform as a stream of digital values. When the pointer reaches the last value in the table array, it will reset to point one and begin a new cycle. Changing the wavetable size means switching to a different sized wavetable with the same, updated waveform. This would require dozens, hundreds, or even thousands of individual wavetables, one for each pitch, which is obviously totally inefficient and memory-consuming. Digital systems, especially mixers that combine several synthesized or recorded signals, are designed to work at a fixed sampling rate and to make sudden changes to it is once again inefficient and extremely hard to program. The sample rate required to play high frequencies with an acceptable level of precision becomes very high and puts high demand on the system. is the sample rate. It is important to note that because the step size is being altered, the read pointer may not land exactly on the final table value N, and so it must "wrap around" in the same fashion as the functionally generated waveforms in the earlier section. This can be done by subtracting the size of the table from the current pointer value if it exceeds N; the algorithmic form of which can easily be gleaned from the examples above. Truncation and rounding. By removing the fraction after the decimal point we reduce the step size to an integer—this is truncation. For instance, 1.3 becomes 1, and 4.98 becomes 4. Rounding is similar, but chooses the closest integer—3.49 becomes 3, and 8.67 becomes 9. For simple rounding, if the value after the decimal point is less than 5, we round down (truncate), otherwise we round up to the next integer. Rounding may be supported in the processor at no cost, or can be done by adding 0.5 to the original value and then truncating to an integer. For wavetable synthesis, the only difference between truncation and rounding is a constant 0.5 sample phase shift in the output. Since that is not detectable—and neither an improvement nor a detriment—a decision between truncation and rounding comes down to whichever is more convenient or quicker. Linear interpolation. This is the method of drawing a straight line between the two integer values around the step location and using the values at both points to generate an amplitude value that interpolates between them. This is a more computationally demanding process but introduces greater precision. Higher order interpolation. With linear interpolation considered first order interpolation (and truncation and rounding considered zero order interpolation) there are many higher-order forms that are commonly used—cubic Hermite, Lagrangian, and others. Just as linear interpolation requires two points for the calculation, higher orders require even more wavetable points to be used in the calculation, but produce a more accurate, lower distortion result. Sinc interpolation can be made arbitrarily close to perfect, at the expense of computation time. By increasing the wavetable size, the precision of the above processes becomes greater and will result in a closer fit to the idealised, intended curve. Naturally, large wavetable sizes result in greater memory requirements. Some wavetable synthesizer hardware designs prefer table sizes that are powers of two (128, 256, 512, 1024, 2048, etc. ), due to shortcuts that exploit the way in which digital memory is constructed (binary).